And that, my friends, is the completion of my Ravelympics projects for this year! 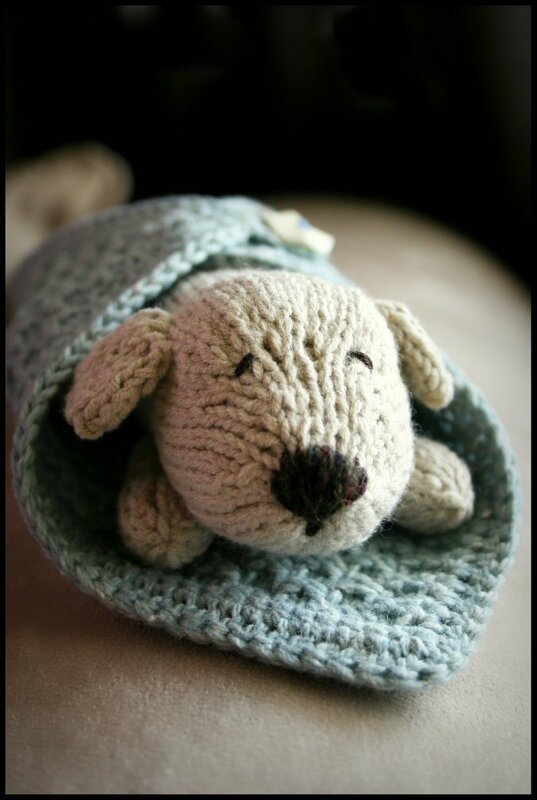 This pattern "Wrap me up Puppies" is also from the book Itty Bitty Toys. I just love this book. 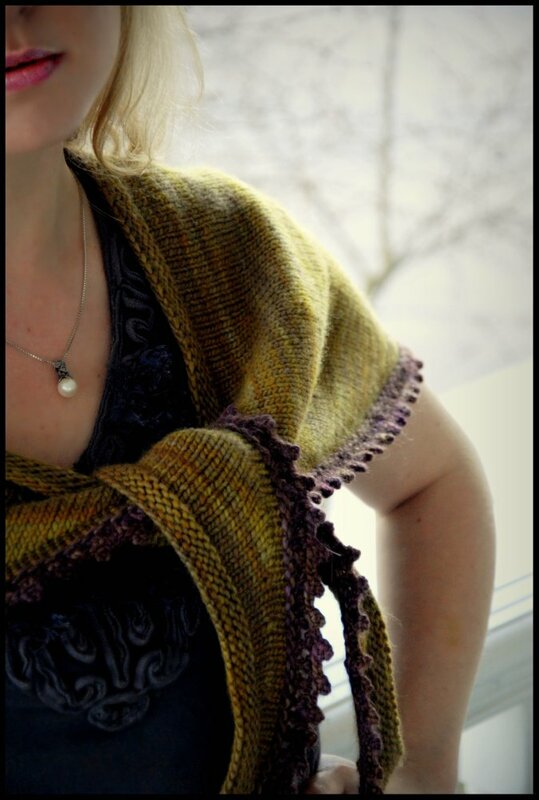 This is now the 3rd pattern I've knit from it. I'm pretty sure that Susan B. Anderson is a toy knitting genius. 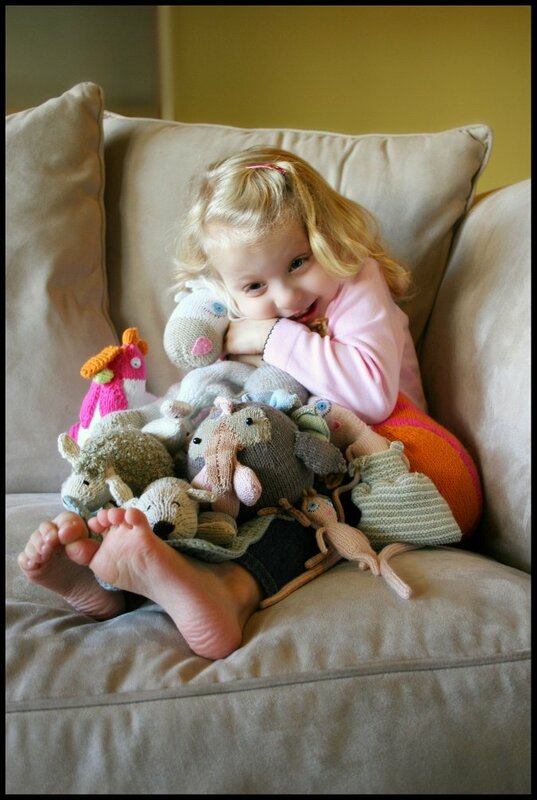 My daughter absolutely loves putting her stuffed animals and dolls to bed. That is by far her favorite playtime activity. From the first time I flipped through this pattern book, I knew that this is a toy that I would definitely make one day. I just love how you can wrap this little blanket around and fasten it up like a little puppy burrito. and was the easiest toy out of the 3 to make. I would definitely consider making this one again. My daughter is of course thrilled to add puppy to her knitted toy collection.. Almost done with toy #3! 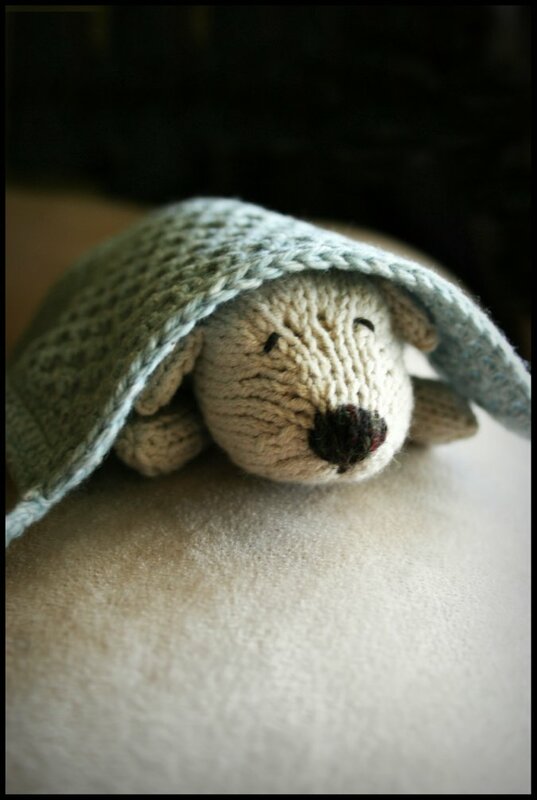 This little sleepy puppy just needs a knit accessory from me before it is completed. He's awfully cute, isn't he? I've now gotten started on toy #3 for the "Ravelympics"! 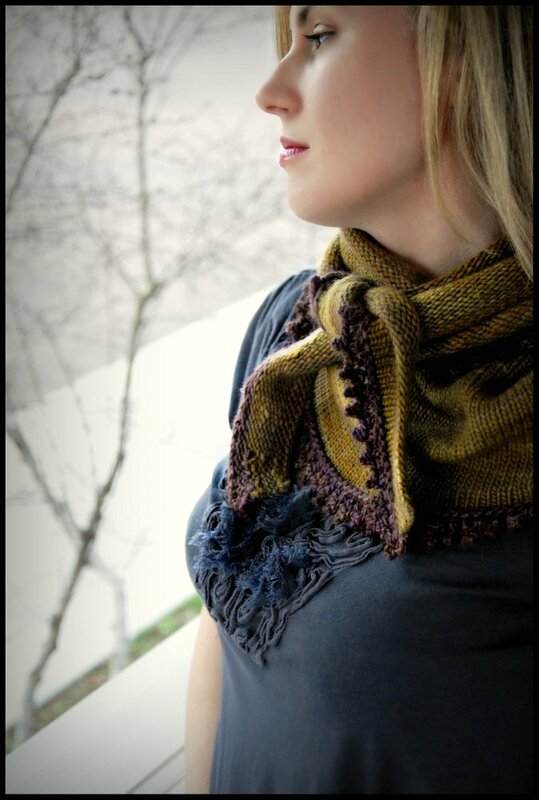 This time I am pleased to be using up some partial skeins of yarn from projects past. The tan skein is leftover from my daughters knitted horse from ages ago. The blue is leftover from the reversible blue bird I knit up recently. 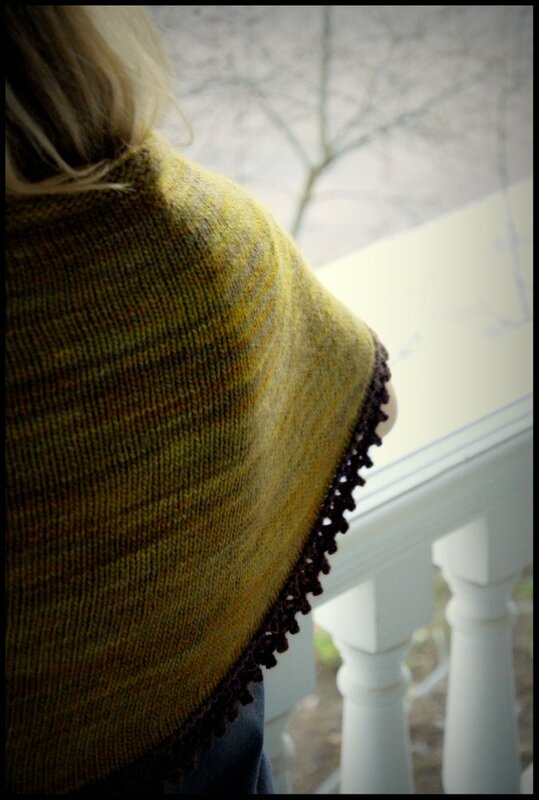 It feels so good to knit things from scraps! Yep! 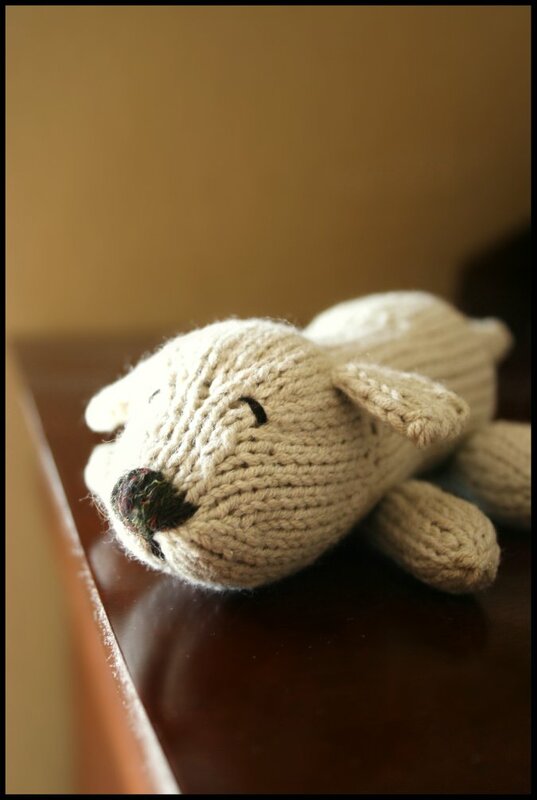 Its a Lamb! Isn't he cute? This was a pretty fun pattern to make. 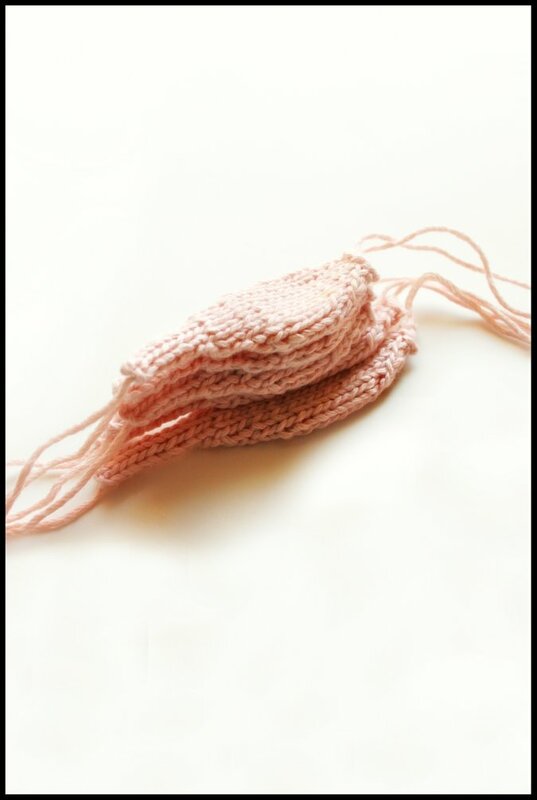 but you can also find this pattern for free online here in Petite Purls magazine. 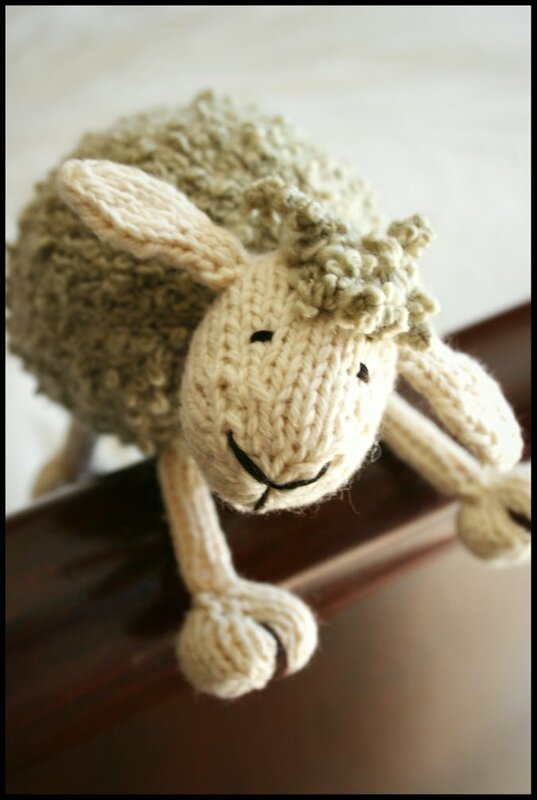 What knitter doesn't love a knitted lamb? wait a long time for him to be done. 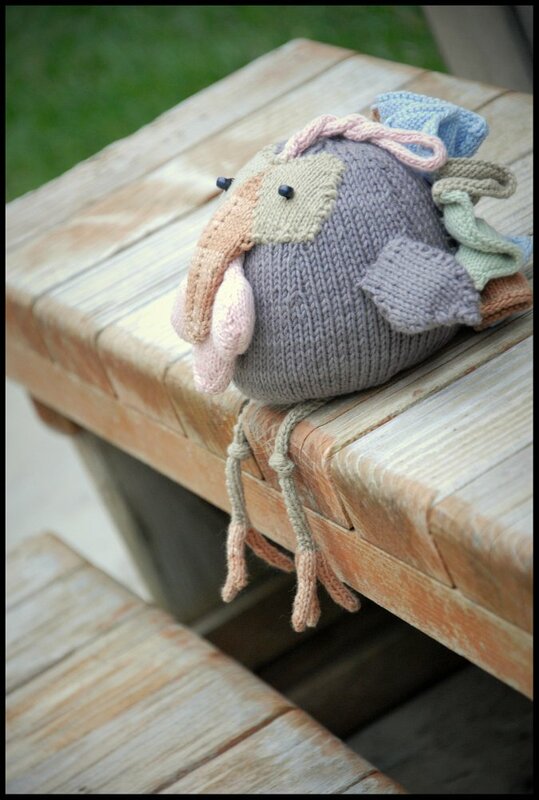 I used Debbie Bliss Cashmerino Astrakhan for his nubbly woolly body, and O-wool Balance for his legs and face. The combination makes for quite a cuddly little toy. 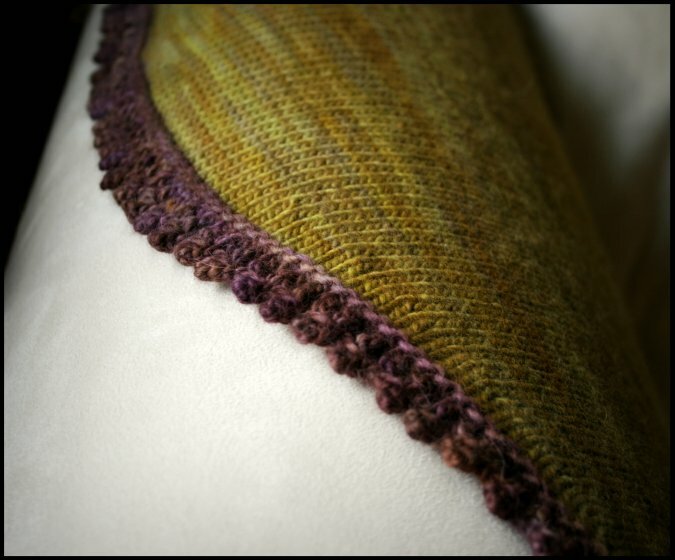 I love the boucle texture of the Astrakhan yarn but it was sort of a pain to knit with on such a tight gauge. The results were well worth it though! I think that the textured body really makes him extra special. Well.. its 11 days into the "Ravelympics" and I have 2 out of 3 toys completed! 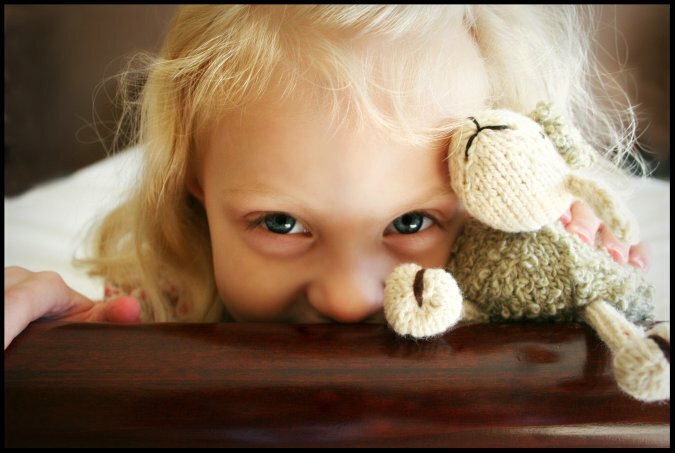 Don't Francis and Lamby look so cute together on my daughter's shelf? I've been working very hard on my Ravelympics projects and I'm glad that I'm ahead of the game. I didn't plan the end of this month very well.. and now I have Stitches West, the Ravelympics and a new podcast episode due all at the same time! Ahh! I am almost done with "Ravelympics" toy #2! I just have 2 more legs to attach and a face, ears and tail to knit. I think I might be able to finish it tonight! This little guy is from one of my favorite toy books, "Itty Bitty Toys". Anyone know what kind of animal this one is? Ravelympics Day 9: Onto The Next.. I've started my next "Ravelympics" toy! from the thin cotton I was using for Francis. I think that this new little animal will work up awfully fast! 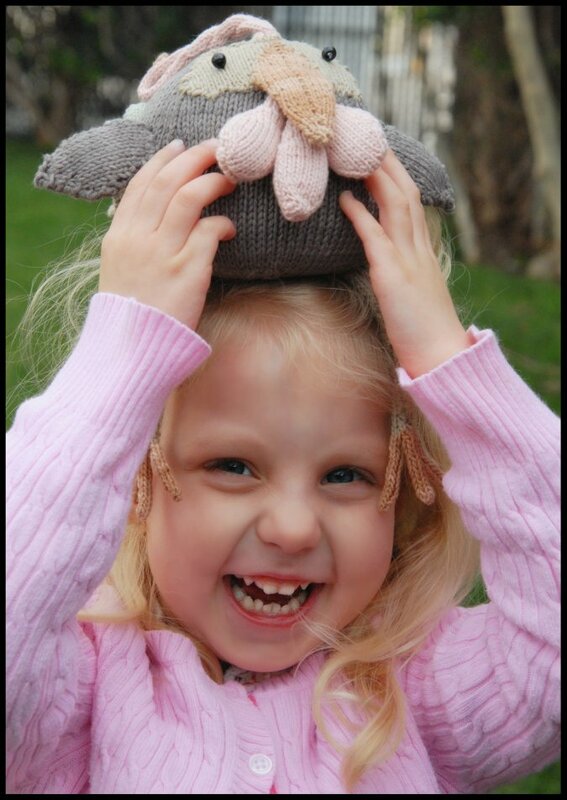 Meanwhile.. my daughter is having a lot of fun with her new turkey friend. 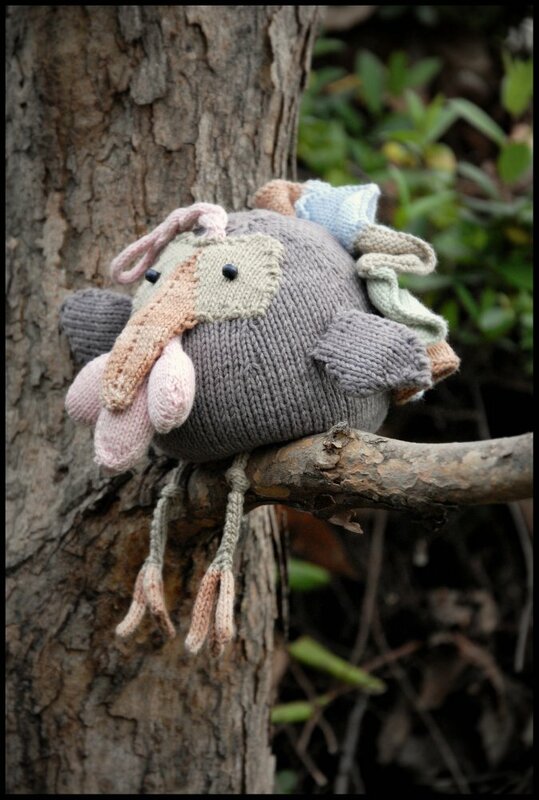 I love the way Francis the Turkey turned out..
but I don't think I would ever want to knit him again. The pattern was a bit fiddly with lots of pieces, sewing, intarsia and woven in ends. But only one of you (Christina) guessed correctly. And isn't he so funny and ugly-cute?! I love how fat he is. We have a lot of Wild Turkeys around where we live. They really are ugly things in real life, but fun to watch and listen to. 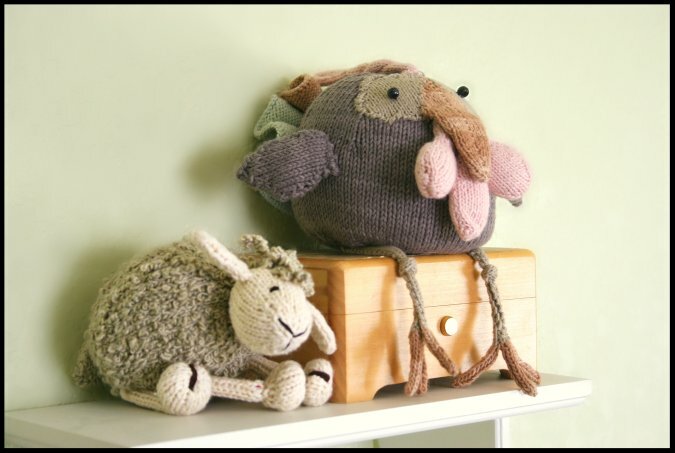 The Organic Cotton Kids Collection put out by Rowan yarns. All the patterns in this collection are super adorable, and all use Rowan purelife organic cotton. 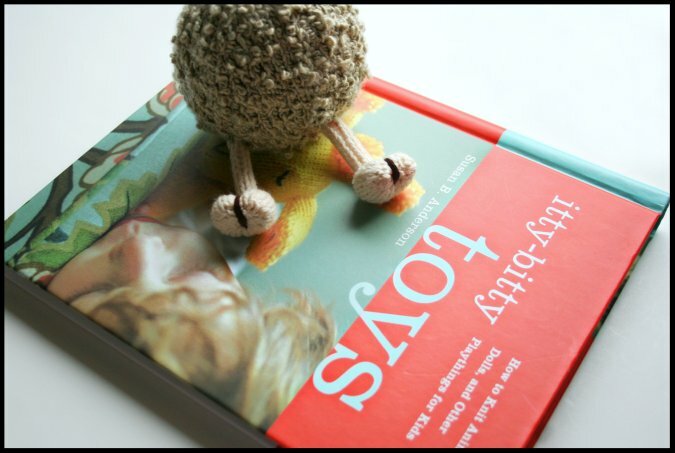 This book seriously has some of the cutest toy patterns I've seen. If you like Francis you will love the other patterns too. 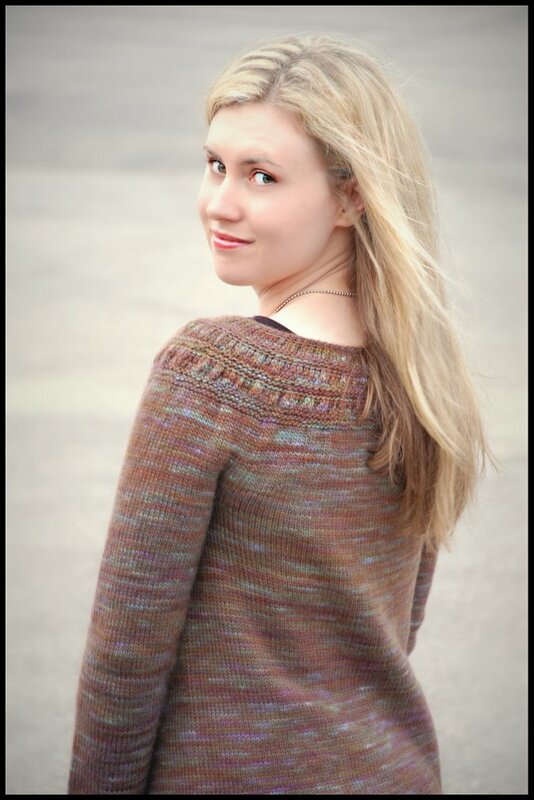 My Tea Leaves Cardigan is done, and I absolutely love it! It fits great! definitely pick up fewer stitches next time. This current buttonband could use some shortening. I might fix it one of these days.. if I feel like it... maybe. 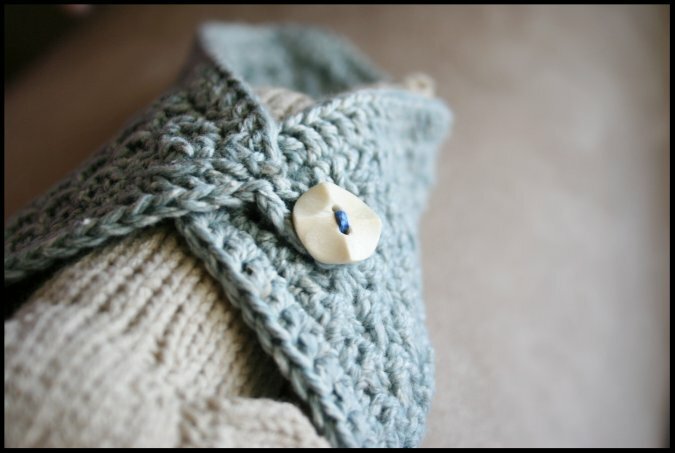 This cardigan is super cozy and wonderful, one that I will wear often for sure! What? You want one too? beautiful pattern is found here. Soft madelinetosh yarn is found here. Fabulous lightweight buttons are found here. He has legs! 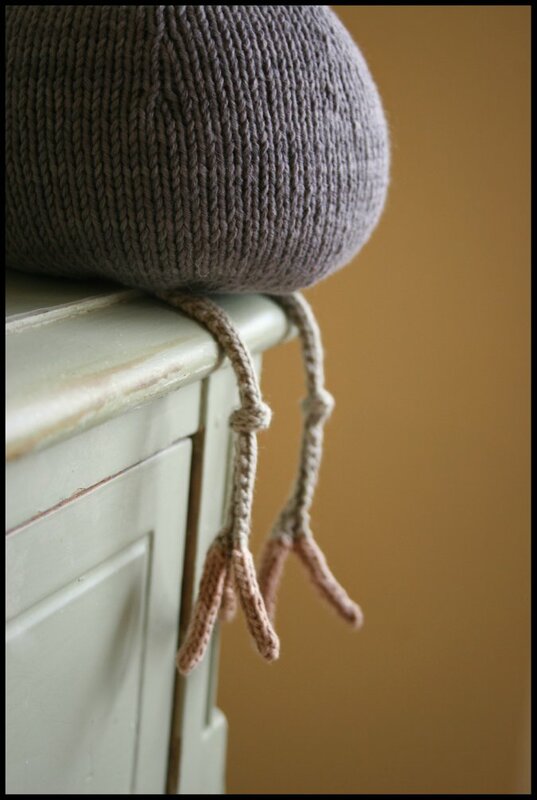 And don't you just love those knobby knees? 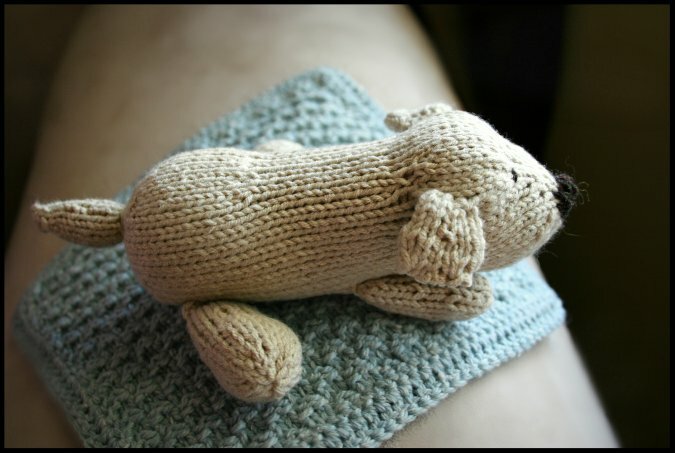 Any guesses yet to what kind of little creature I'm knitting for the Ravelympics? This little toy that I am making for the "Ravelympics" requires many knitted I-cords. So that's what I was doing today. I-cords. And lots of them. I-cord trivia: Do you know why they are called I-cords? So there you have it... an idiotic mistake turned knitting invention! 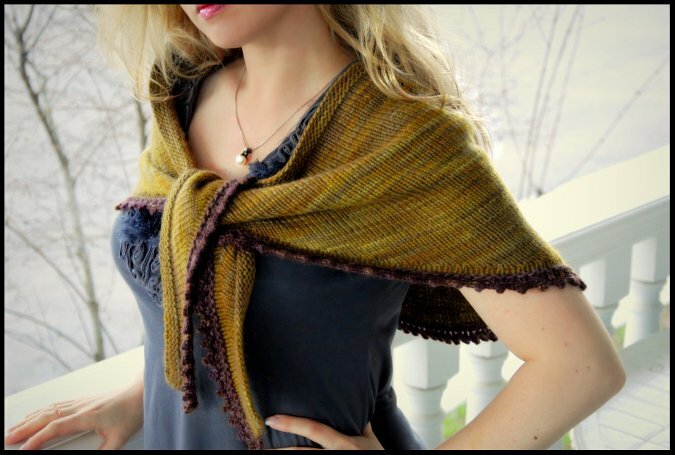 Learn how to knit one HERE with this video tutorial. ...I've got this nice plump animal body. 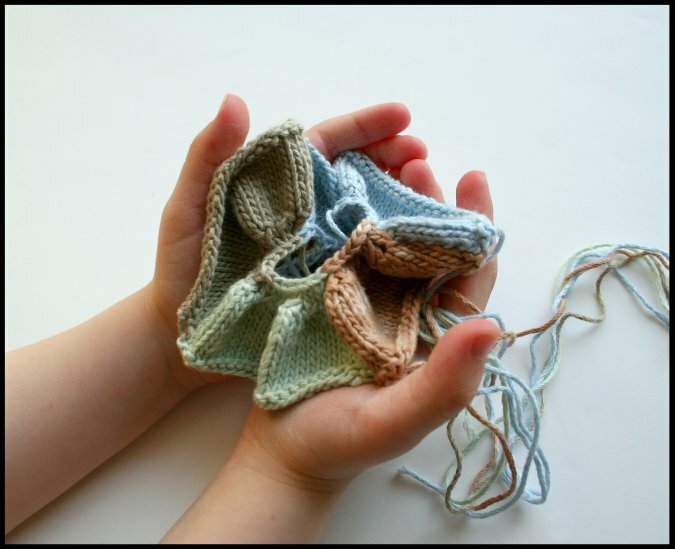 A perfect blank canvas for all sorts of knitted body parts to be sewn onto. I feel like I'm finally making progress now. Today I am doing some ironing and sewing up. as you go rather than leaving it all for the end. This is what I've created since yesterday. And Yes. Little intarsia pieces like this take awhile when knitting with 4-ply cotton on size 1 needles! for the ravelympics is going to be a challenge in itself. seeing my daughter's reaction during the process. She is always talking about her new toys, and questioning my speed and knitting ability. "Mom! Are you done with my toy yet?" "Why are you making it like that?" 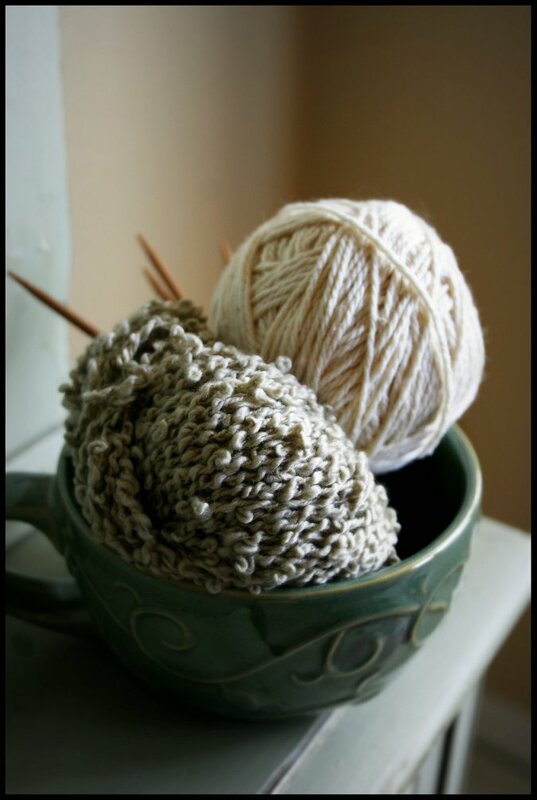 No matter what I do with intarsia it always looks this way! 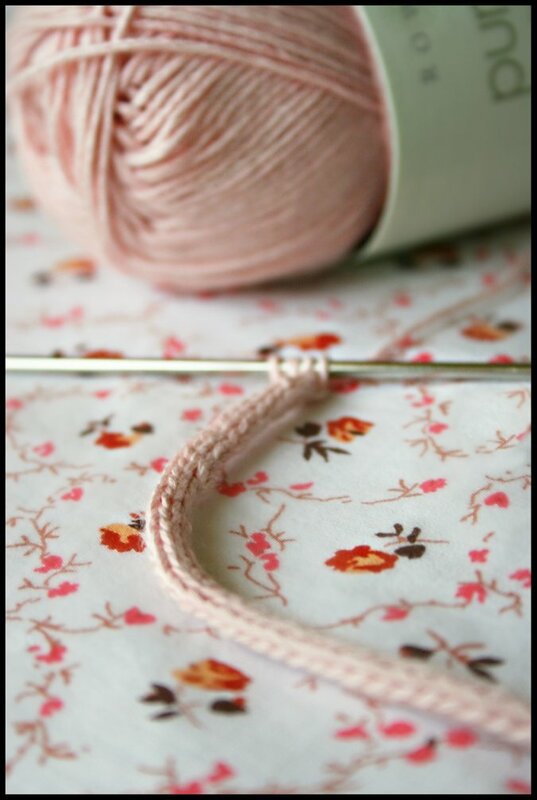 Ive tried bobbins, small lengths of yarn.. everything! 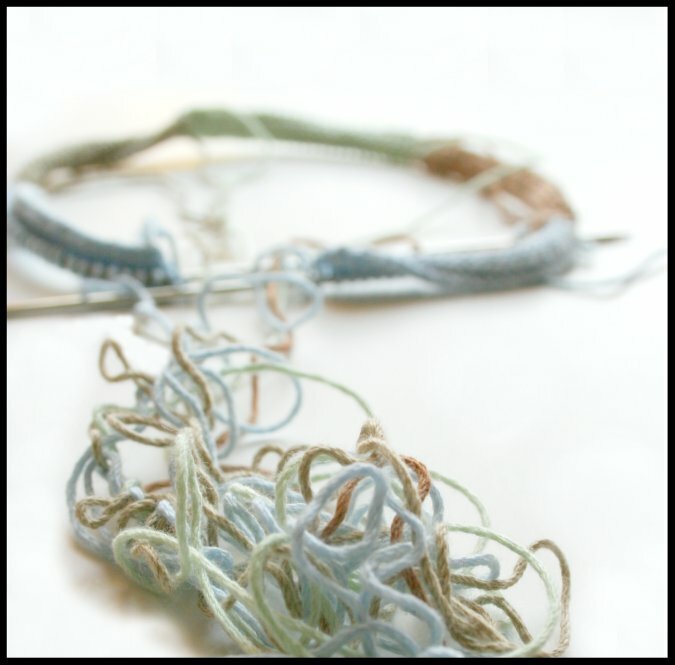 I think the key is to just unravel and untangle at every color change. What a pain! I'll be casting on for the Ravelympics this evening at 6 pm. 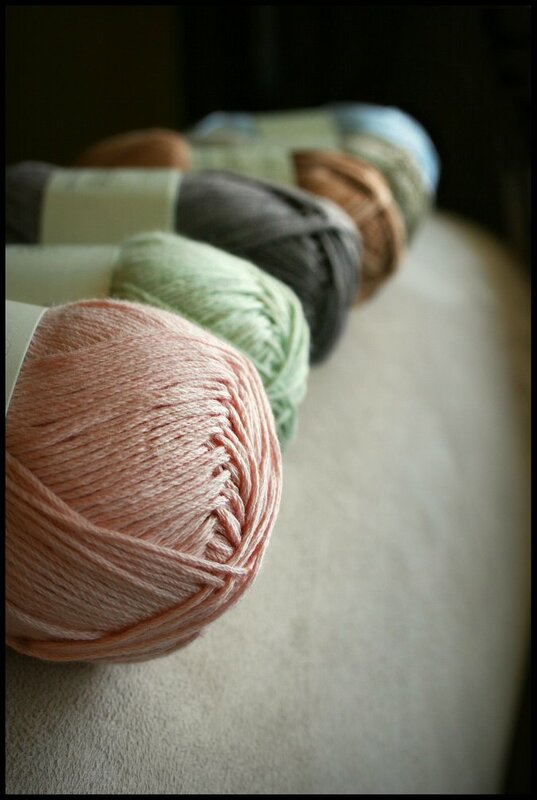 that uses this color combination of Rowan Purelife Organic Cotton. You'll have to wait and see what kind of animal he is! A sneak peak of what's coming up! This is another wrap design that I've been working on in the past month. It has misbehaved greatly on the needles.. I've had to knit it twice to get the shaping just right. Just in time for the ravelympics this year! Getting Ready For The Ravelympics! Its also time for the Ravelympics! The "Ravelympics" is an event put on by Ravelry.com. The concept of Ravelympics is to challenge yourself by starting and finishing projects during the 2010 Winter Olympics. Choose a project that will be a stretch for you or that will force you to perfect a new technique. 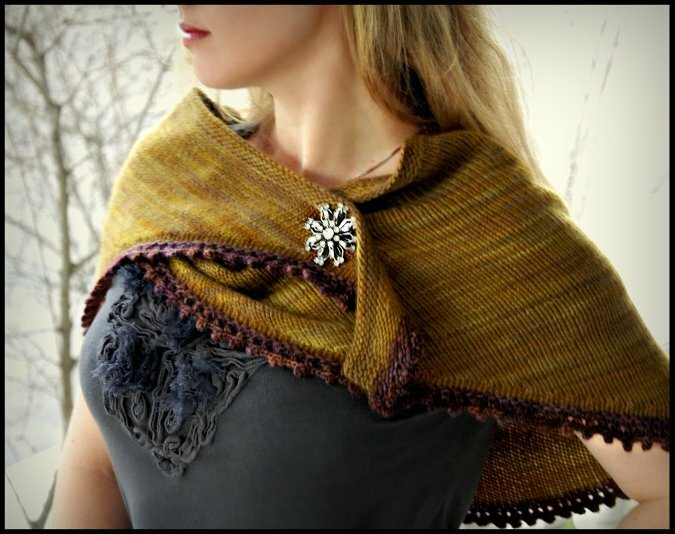 Ravelry.com states, "The goal of the Ravelympics is to support you in expanding your knitting/crocheting horizons. Just remember the one rule: Challenge yourself!" The Ravelympics officially begin at 6 pm Pacific Standard Time February 12, as the Opening Ceremonies begin in Vancouver. Now is the time for all of us to pick our projects, enter the events and pick a Ravelympics team. Please join team Never Not Knitting for the Ravelympics this year! 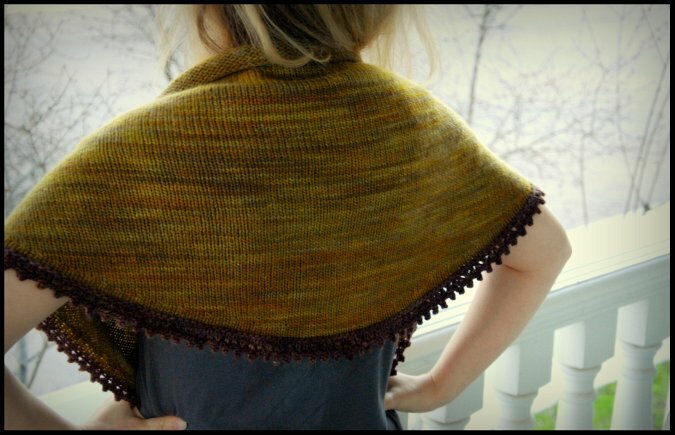 We have a wonderful, active ravelry group and would love to have you knit along with us. Also there will be a special Ravelympics drawing in the Never Not Knitting group for all of you who complete your Ravelympic project goals. 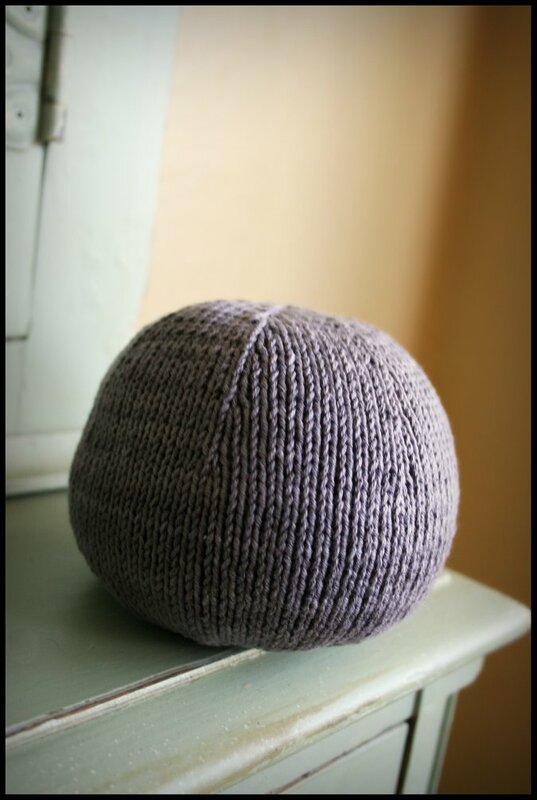 Show your support for Team Never Not Knitting and add this button to your blog. I've gathered all of my Ravelympics knitting supplies. My goal is to complete a series of little knitted toys for my daughter AND to share my progress on the blog every day during the Ravelympics! 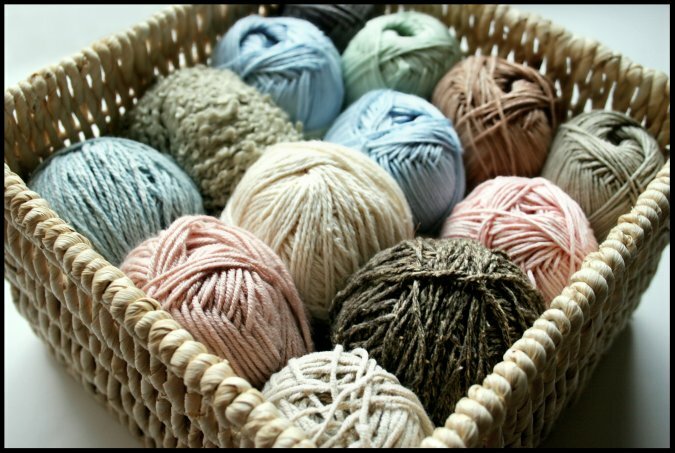 The yarns I chose are mostly natural organic fibers in lovely muted tones.I think that this color palette lends itself very well to children's playthings. I cannot wait to get started!